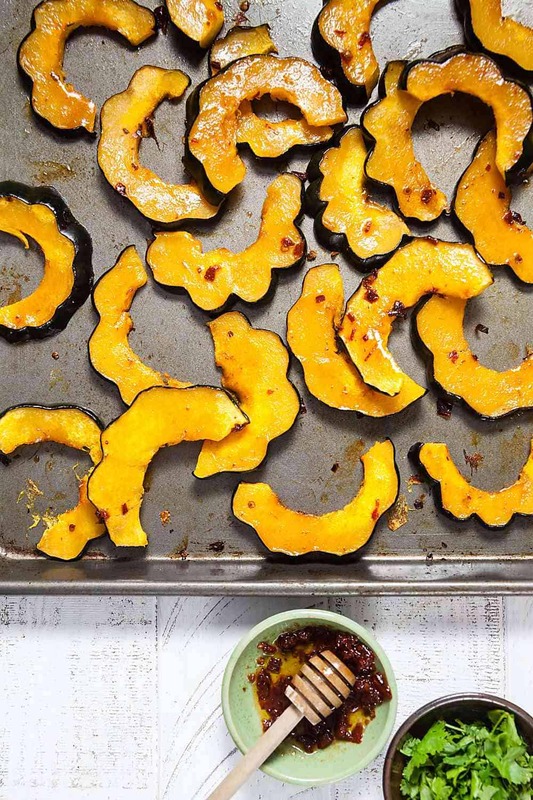 Honey Chipotle Roast Acorn Squash | Healthy. Delicious. 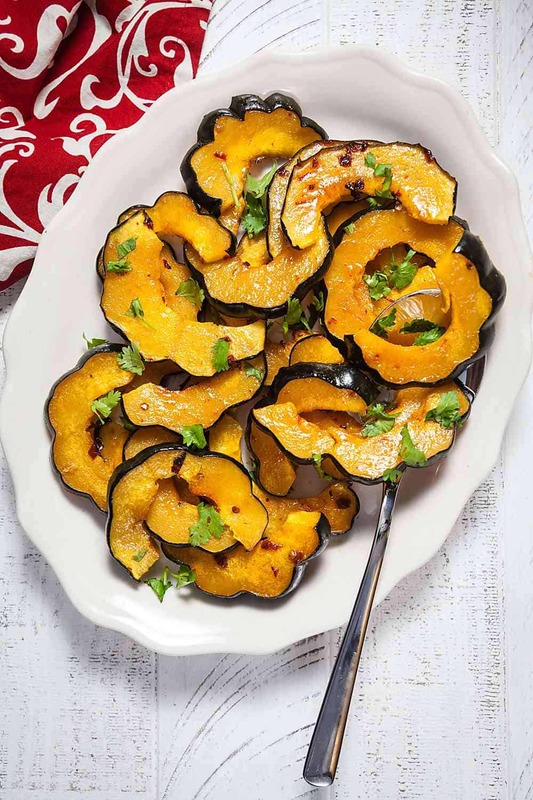 Honey chipotle roast acorn squash is one of those recipes that’s meant as a side dish but works just as well as the star of your dinner table. 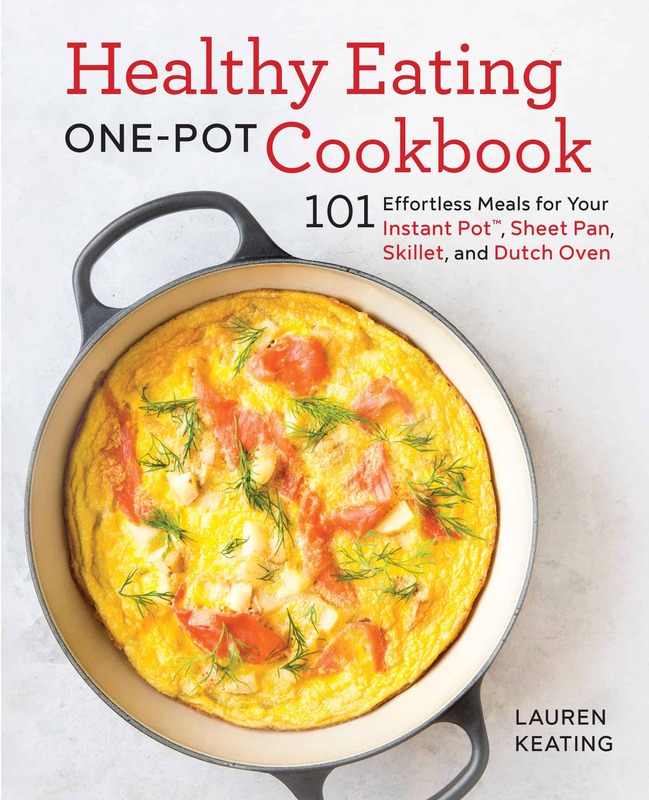 Serve it as part of your holiday feast (keep reading for an entire honey-inspired holiday menu!) or enjoy it with quinoa as a simple, nourishing meal. I created this recipe for my client, National Honey Board. Thank you for supporting the products that keep me inspired in the kitchen and help make Healthy Delicious possible. For years, winter squash made an almost-nightly appearance on our dinner table between October and February. Then, for some reason, it fell off my radar. Save a random spaghetti squash here or there, we’ve barely eaten it at all in the last few years. This winter, I’m making an effort to include more squash in my life. And I’m starting with acorn squash because, let’s be honest, any vegetable that’s routinely served with a sticky-sweet glaze has a special place in my heart. I mean, yeah. 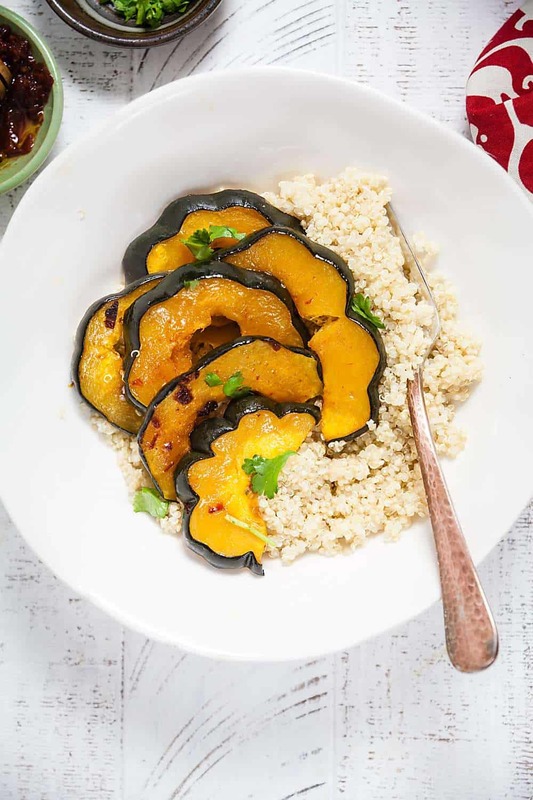 This honey chipotle acorn squash recipe is incredibly simple, but it has so much flavor. 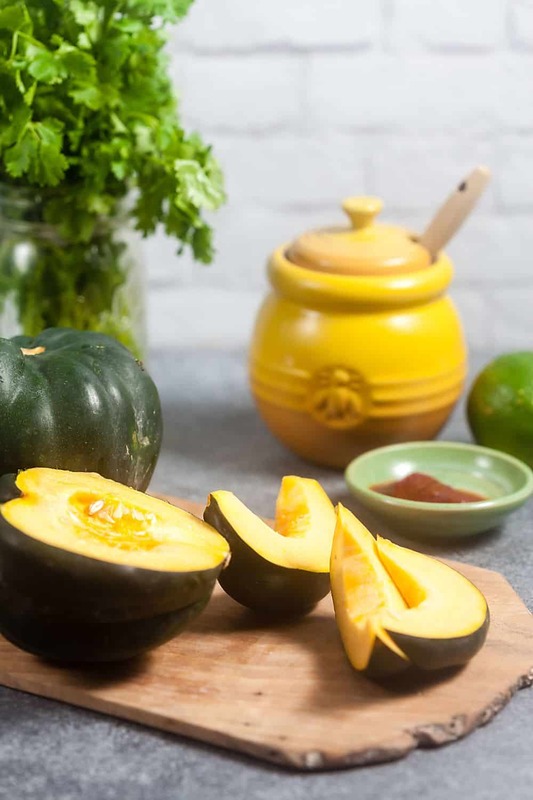 Honey adds the sweetness that we’ve all come to expect acorn squash to have, while minced chipotles in adobo contribute smokey heat. Add a pinch of salt, some lime juice for an acid, and a handful of cilantro for a hint of freshness, and you’ll be left smacking your lips. As an added bonus, this recipe is incredibly affordable. Acorn squash has been on sale for something ridiculous like 30-cents a pound lately. The rest of the ingredients (there are only six of them) are pantry staples that I always have on have. 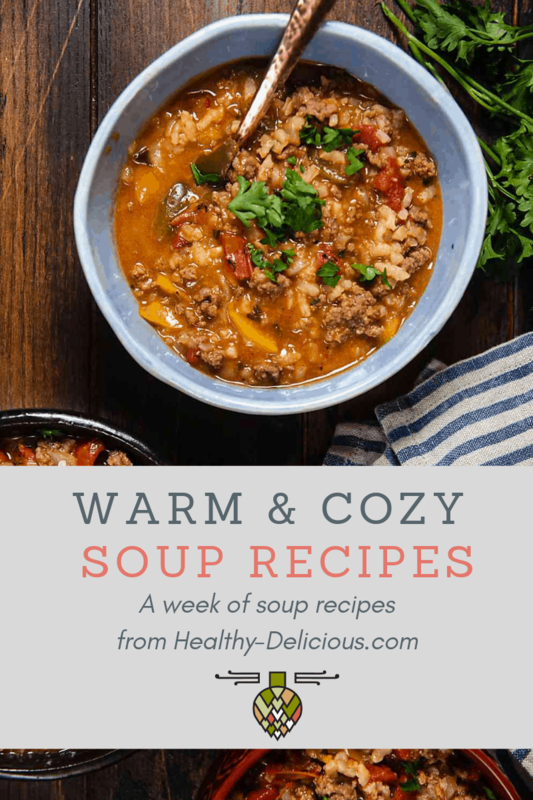 This recipe will definitely be making a regular appearance this winter. Honey is an emulsifier, which makes it a great ingredient to thicken and add body to sauces and dressings. For this recipe, I adapted my favorite honey-chipotle vinaigrette and used it to add a touch of sweet heat to roast acorn squash slices. Half of the dressing is brushed onto the squash before it goes into the oven, so the sugars can caramelize and brown (yum!). Honey helps attract moisture, so it also keeps the squash from drying out or getting leathery. As a final touch, the remaining vinaigrette gets drizzled over the cooked squash right before it’s tossed with fresh cilantro. If you really want to get festive, you can go ahead and throw some pomegranate arils on there, too. Like I mentioned above, this honey chipotle roast acorn squash is really versatile. It has a ton of flavor, so it can definitely hold it’s own as the main highlight of your dinner (although you might want to make a double serving.) Originally though, I created it as a side dish for a honey-inspired holiday menu. If you love honey as much as I do, you’ll definitely want to check it out – we have you covered from a pre-dinner cocktail right through dessert! You can also visit honey.com for loads of recipe ideas perfect for any time of year! 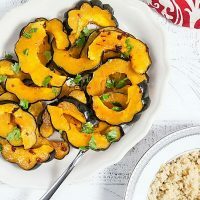 Honey chipotle roast acorn squash is one of those recipes that’s meant as a side dish but works just as well as the star of your dinner table. 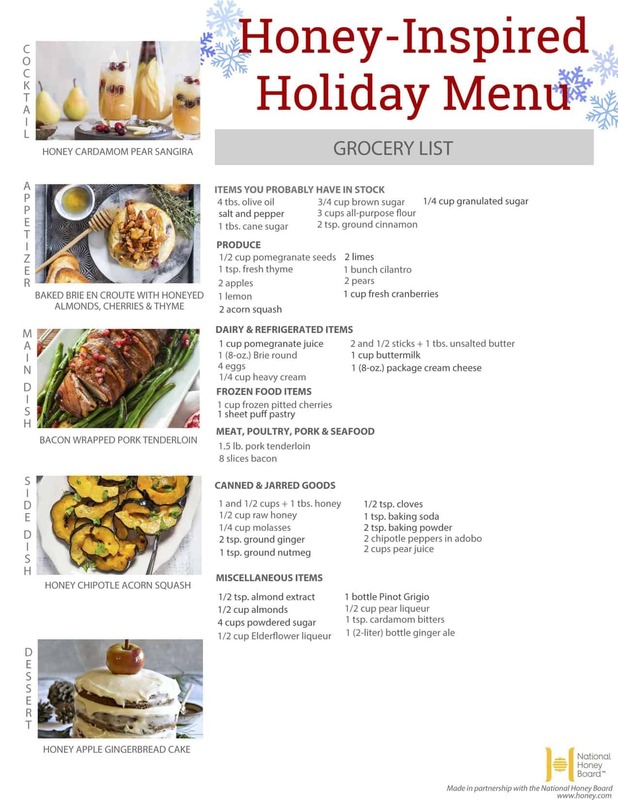 Serve it as part of your holiday feast (keep reading for an entire honey-inspired holiday menu!) or enjoy it with quinoa as a simple, nourishing meal. Heat your oven to 350ºF. Cut the acorn squash in half, stem to root. Scoop out the seeds and pulp. Cut the squash into 1/2-inch slices and arrange it in a single layer on a baking sheet. Mince the chipotle pepper very finely and place it in a small bowl. Add the honey, lime juice, and salt; mix in the olive oil. Brush half of the honey-chipotle glaze onto the squash. Bake for 35-45 minutes, or until the squash is tender and the underside is golden brown. 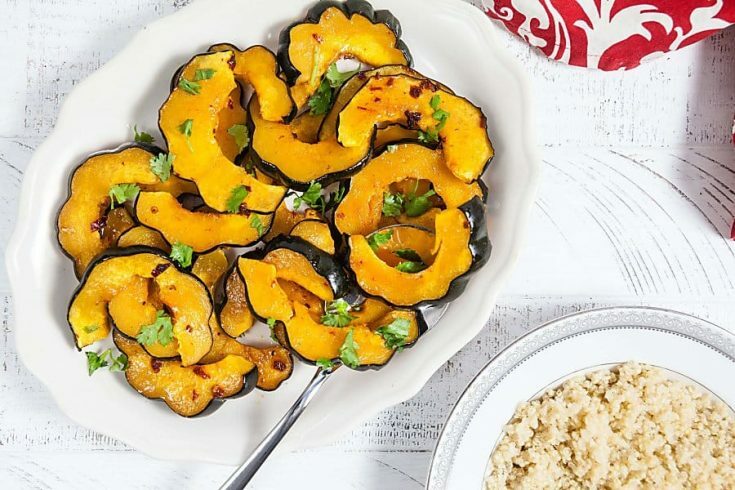 Drizzle the roast squash with the remaining glaze and sprinkle with cilantro. Any extra chipotles in adobo can be frozen for use another time. Oh man, this has my name all over it. I LOVE acorn squash and it is so delicious with chipotle!